H.E.Governor Wycliffe Ambetsa Oparanya has described devolution as a boon to all Counties across the country and called upon County Assemblies to support him and the Council of Governors to defend it. Addressing members of Busia County Assembly today in a special session, Hon. Oparanya who is also chair of the Lake Region Economic Bloc and chair of Council of Governors urged the 14 member strong LREB to effectively utilize the abundant resources and socio-economic attributes of the region under the framework of the economic bloc. 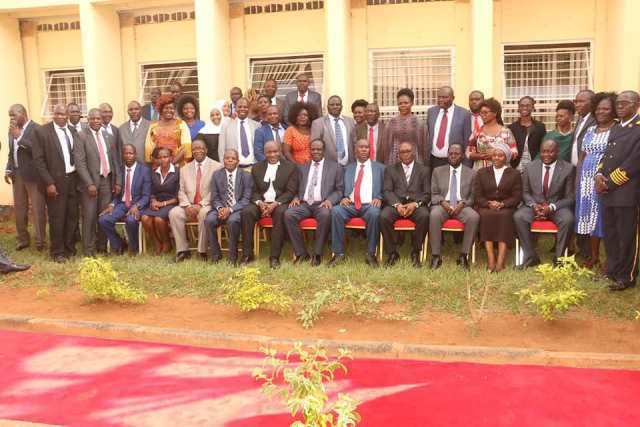 He commended Busia Assembly and the County leadership including Governor Sospeter Ojaamong and the Speaker of the Assembly for supporting the bloc and approving the LREB bills. “LREB is now a legal entity, thanks to your unwavering support, ” he said. He also urged the LREB fraternity to leverage on the powerful position of CoG chairmanship to advance the cause of devolution in the country, saying the system was being weakened by the national government through progressive reduction of shared allocation between the two levels of government. Other governors present; H.E. Sospeter Ojaamong (Busia), H.E. Prof. Anyang Nyong’o (Kisumu) and H.E. James Ongwae (Kisii) also addressed the Assembly and urged members to make the bloc a reality. Speakers of Busia (Hon.Bernard Wamalwa), Hon. Mudeizi Hasna (Vihiga) and Hon. Morris Buluma (Kakamega); as well as Kakamega County Leader of Majority, Hon. Joel Ongoro and MCAs from the four counties. Other dignitaries were CECMs, County Secretary and Head of Public Service of Kakamega, Madam Jacinta Aluoch Odhiambo, Chief of Staff, Mr. Robert Sumbi and Advisors.